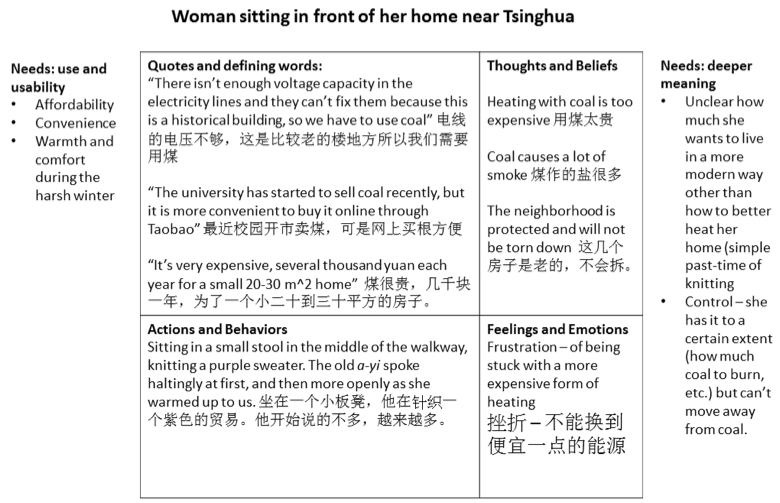 The past few days, we’ve been working to understand the heating situation near Tsinghua University across a variety of building types, ranging from old hutong style buildings to campus coffee shops. Types of technologies we’ve seen range from coal stoves to district heating. One key interview that stood out was one with an old woman who had lived in the historical preservation buildings near campus. 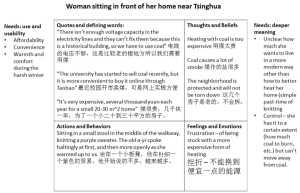 To get her to talk more freely, we focused not only on the logistics of her coal use, but also the feelings involved. She was frustrated with the inconvenience and cost of the coal, on top of the health impacts from breathing in so much smoke the winter. She didn’t like that the building’s historical preservation status meant that it was impossible to redevelop the electricity, which couldn’t handle additional voltage for electric heaters. Moving forward, we will be doing research online (Taobao!) to see prices for coal and get a better sense of building efficiency improvements, and capture additional insights. On the fourth floor of the Tsinghua Art and Design building, perched atop lockers next to long windows that span the entire length of one wall of the building’s inside courtyard, I write. Outside, there is an array of matching windows on each of the other three courtyard walls. These windows are not identically, as many are cracked open to varying degrees. While summer draws to a close and Beijing enters its most comfortable season, the pollution remains light, assisted in part by a quiet breeze, yet in just a few months, a dry chill will descend upon the city, casting some areas in severe cold, and a few in severe heat. As one Tsinghua student described, sometimes the dorms located on higher floors of the dormitory building are heated to such an extent that students want to open the windows in the middle of winter, showing a lack of efficiency in existing HVAC design.